Perdue was widely supported by the nation’s largest farm groups. Many environmental groups remain skeptical of his roots in agribusiness. Before serving two terms as governor of Georgia, Perdue served in the Georgia state Senate. He has a long career operating agribusiness and transportation companies, both before and after his stint in the governor’s mansion. As governor of Georgia, Sonny Perdue visited the U.S. Embassy in Uruguay in 2010. Up first on Perdue’s to-do list: smoothing a dairy trade flare-up with Canada. And that’s just a hint of the diplomacy Perdue will need as the administration rewrites old deals such as the North American Free Trade Agreement, or NAFTA, and forges new ones with individual countries. The administration says it plan to work on bilateral deals, particularly in Asia and beginning with Japan. Since exports are a major source of U.S. farm income, producers are looking to Perdue to advocate for their needs in trade talks. 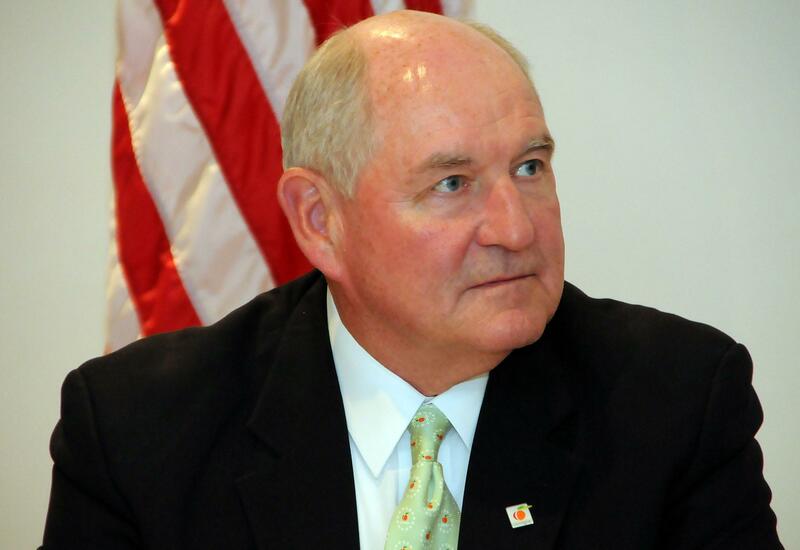 Perdue will also need to start fighting for his own department’s budget, which would lose over 20 percent of its discretionary spending, according to an initial budget outline released by the Trump White House. And hearings have already begun for the next farm Bill, due in 2018 and responsible for farm subsidy programs, food stamps and school meals, rural infrastructure and much more. Rural voters contributed mightily to Republican victories last fall, but for three months the department charged with overseeing farm programs and rural development, which has about 90,000 employees and an annual budget of more than $150 billion, has been waiting for a new leader. As President Trump reaches his 100th day in office this week, he plans to sign an executive order on as-yet-unnamed rural issues, reviving an election trail focus. It may fall to Perdue to take Trump’s promises out into the field.